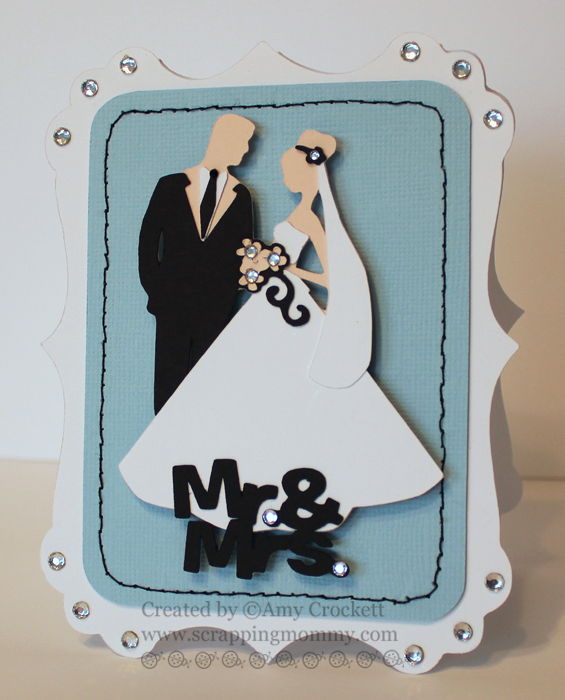 The Card base is cut welded and cut out with my Cricut and the Elegant Edges cartridge. 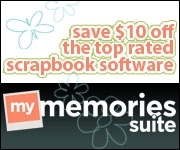 I used the Creative Memories Divine Wedding cartridge for the bride and groom image. I stitched around the blue base and added some bling with my Imagininsce i-rock. The tag is cut with my Cricut and the Art Philosophy cartridge and I added some journaling and check boxes by hand. The Congrats sentiment as well as the little heart are both from SRM Stickers. The patterned paper is from Pink Paislee. I added some stitches to the patterend paper with my sewing machine and some pen stitching to the tag. I also added some flat back pearls to the scallops on the tag. I cut out these flowers with my Cricut and some shrinky dink film. I colored the film with a Copic marker before I heated them up to shrink them down. Before they were completely cool, I added a little bit of shape to them, using a towel to protect my hands. I glued on some half back pearls and then glued them onto some hair pins with some jewelery and metal glue from Aleene's. 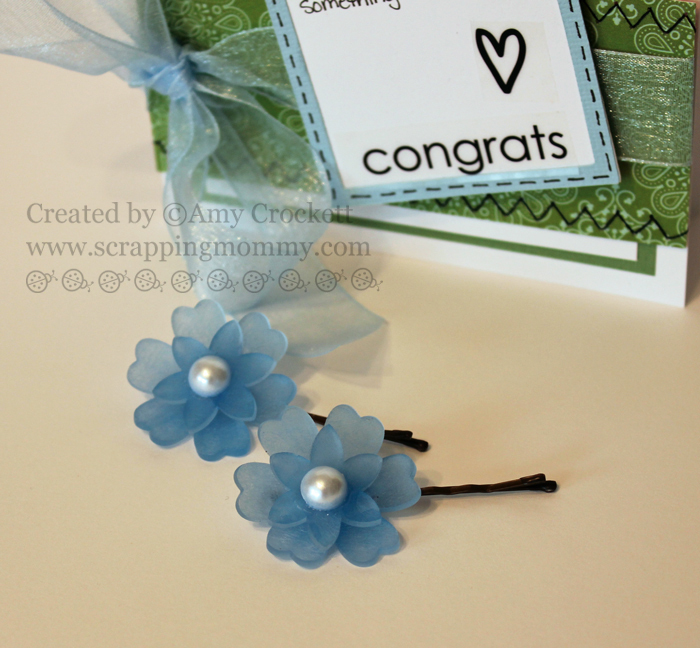 I finished off the card with some sheer blue ribbon. 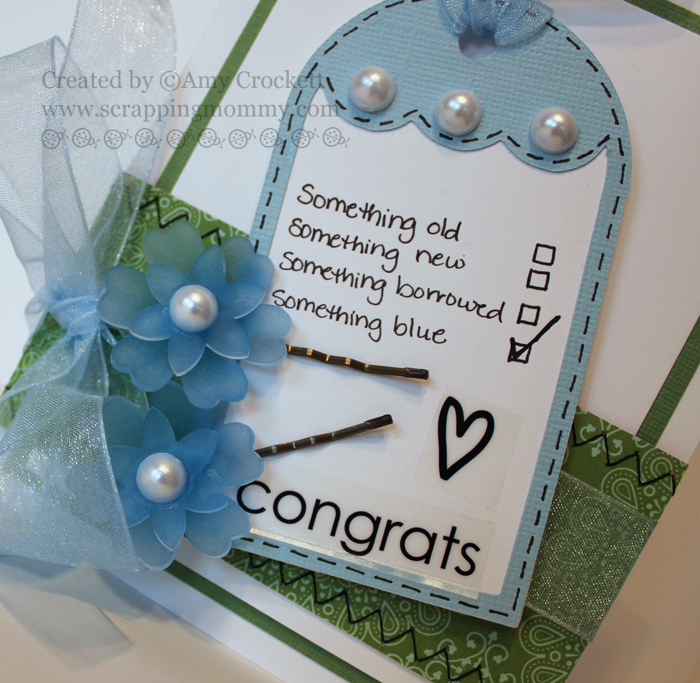 I hope that you have drawn some fun inspiration with these wedding projects that I have shared with you today. Amy ~ Oh my some inspiration ~ a ton! I have to agree with you ~ I LOVE the black/white/blue combination! WOW! I never knew I did! I LOVE the bride & groom cut! 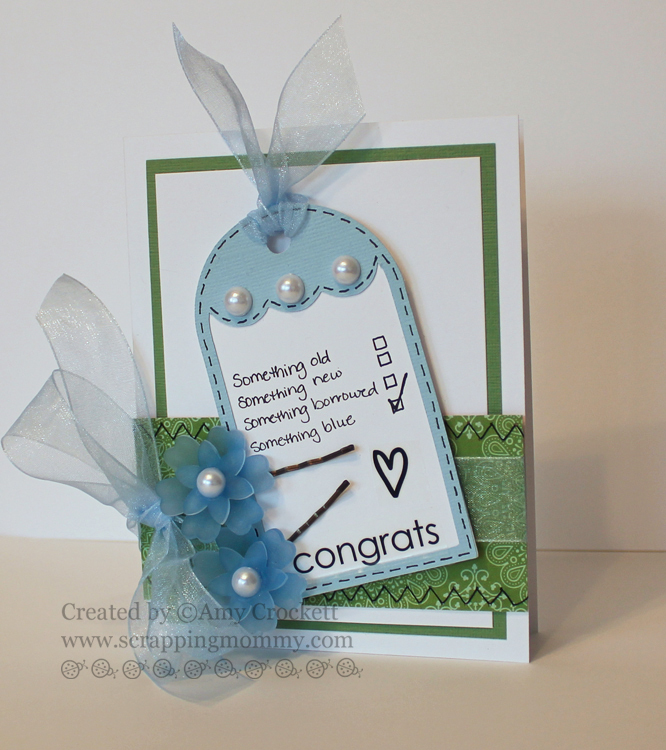 The tag card ~ that is just to CUTE! Those hair pin flowers are simply GORGEOUS!!! I hope your hubby is feeling better real soon! Both of your cards are beautiful. TFS. I am going to craftlift these. I received by blog candy today and WOW. What fun I'm going to have with the cartridge, ribbon and gel pens. Extraordinary projects! The colors are beautiful. I love the extra little gift(hairpins)! I have made many things with shrink film. If you don't mind, I would love to borrow from your idea for hair accessories. My youngest daughter is a girly-girl! Thank you for the inspiration!